Dr. Sharon Chinthrajah with Dr. Kari Nadeau. Use of the anti-IgE medication omalizumab in combination with oral immunotherapy led 83 percent of patients with multiple food allergies to achieve desensitization to at least two allergens in a study conducted by Stanford University researchers. Of note is that desensitization to more than one allergenic food was reached in this majority in only nine months. “To undertake single food oral immunotherapy could take nine months alone,” senior study author Dr. Sharon Chinthrajah told Allergic Living. “To put it into perspective, if you were to do multiple foods sequentially, it would take many years. It takes considerably longer without a combination approach,” she said. The Phase 2 study involved 48 children and teens with multiple food allergies, who were divided into two groups. The first group, composed of 36 patients, was treated with the anti-IgE medication omalizumab (often known by the brand name Xolair) along with oral immunotherapy, in which gradually increasing amounts of two to five of their allergens were introduced into the diet. The remaining 12 patients formed a control group and received a placebo medication alongside the same multiple-allergen OIT therapy. “They were tested at nine months [36 weeks] to see how many patients could pass a two-gram food challenge to at least two of the foods in their OIT regimen,” says Chinthrajah, an assistant professor of allergy and immunology at Stanford’s Sean N. Parker Center for Allergy and Asthma Research. “Eighty-three percent in the omalizumab group were able to pass a challenge of two foods at two grams versus 33 percent in the placebo group,” she says. That rate of success is comparable to some clinical trials using purely OIT (the desensitization achievement rate for those ranges from 50 to 80 percent). But key differences with the Stanford study, published in The Lancet Gastroenterology & Hepatology, are the number of food allergens involved, the shorter time period to achieve desensitization and a better safety profile than OIT alone. 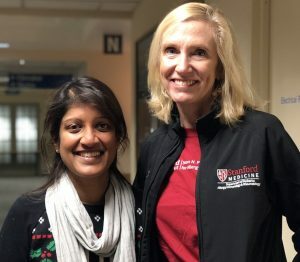 For instance, “there were fewer doses associated with gastrointestinal symptoms and fewer respiratory symptoms in the omalizumab group during a portion of the updosing period,” says Chinthrajah, whose colleagues on the study include Dr. Kari Nadeau, the director of the Parker Center. There were no severe adverse effects among any of the participants, who were between the ages of 4 and 15. As well, the study notes that the time to reach the maintenance dose level for each food (which is the amount a patient continues to consume to afford protection) was achieved in as few as 12 weeks in the omalizumab group. That compared to 20 weeks as the earliest success in the placebo group. “We’re excited to see that our theories of how omalizumab should work played out in actuality,” says Chinthrajah, who emphasizes that the next step is to conduct a larger trial. Omalizumab, given by injection, is known as an “anti-IgE” biological medication, since it neutralizes free-roaming IgE antibodies – those that set off allergic symptoms. The 36 patients in the active drug group of this study were administered omalizumab for eight weeks before they began OIT, then continued on it for eight weeks as the allergenic foods began to be introduced. (The placebo group followed the same protocol, unaware they weren’t receiving the active drug.) Patients were treated with up to five allergens during OIT. Chinthrajah notes that “30 to 40 percent of patients who have food allergies have multiple food allergies and other allergic conditions, which may influence their ability to tolerate an oral immunotherapy program.” The foods included in the study were various tree nuts, eggs, milk, peanuts, soy, sesame and wheat. The research received funding from the National Institute of Allergy and Infectious Diseases, the Parker Foundation along with private foundations. Biotech company Genentech provided omalizumab and the placebo.